Sara Attia is a 16-year-old junior at Colonia High School. Sara has two lovely parents and five siblings. She is an avid reader of anything from Young Adult fiction to Shakespeare. Her favorite books are A Separate Peace, If We Were Villains, and The Hitchhiker's Guide to the Galaxy. Attia enjoys movies, and can spend hours watching them, no matter the genre or level of quality. She recently got a camcorder and is currently attempting to learn about film making. 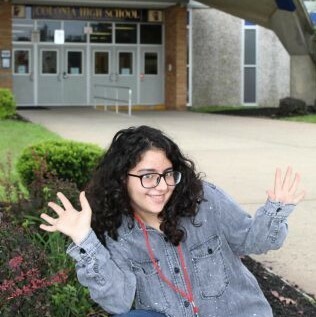 Attia is involved in stage crew for the Colonia High School musical & play. She has a deep love for everything relating to the 1980s- fashion, music, and all. Her favorite subject is English, and she loves to write. Attia has one bird who has lived long beyond his lifespan, and she loves him. She plans to one day pursue a journalism career.